Artist Andy Magee pauses at his desk at SIUE's Art and Design Building. Appearing in Time magazine can have a profound impact on a person's life; just ask SIUE graduate student Andy Magee. The 36-year-old master of fine arts student had a sculpture entitled "Change" featured on Page 46 of the Dec. 29, 2008 edition of Time. That magazine named Barack Obama as its "Person of the Year," and included a display of artwork called "A Man of the People and the People's Art." "Change" is a portrait of Obama measuring 4 feet by 3 feet. 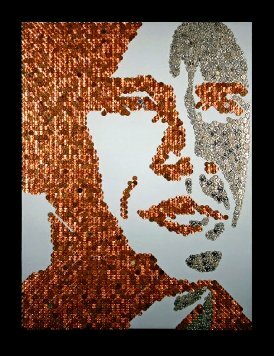 The face is constructed from hundreds of pennies, nickels, dimes and quarters, with the profiles of each president on the coins facing up. Magee said that "Change" reflects his philosophy as an artist. "I believe that art is a tool for communicating ideas," he said. "The 'language' I use should be recognizable to the viewer; so I use materials and imagery that most people are familiar with. I like to use simple, found materials that usually have a universal context. That is to say that most viewers have some preconception about what the material is, what it is used for, and their relationship to it. Then, I throw all of that out the window and rearrange the context of the material to give it a new, or enhanced meaning." Above, a full-size image of "Change." 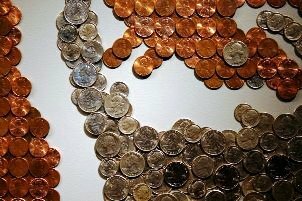 Right: A closer view shows the individual coins that comprise the portrait. For "Change," Magee received contributions from family and friends who emptied their pockets and coin purses. Another piece, "World Map, 2006" features 10,000 green and tan plastic toy soldiers arranged in a continental map of the world. The soldiers are arranged in concentric circles, with the center point being in the Washington DC vicinity. The piece received the Grand Award at the 50th Annual Delta Exhibition in Little Rock, Ark. His work "Artificial Sweetener" uses hundreds of packets of Equal, Splenda and Sweet'N Low to recreate the famous Andy Warhol print of Marilyn Monroe. The 8-foot by 8-foot mural was part of the SIUE Graduate Student Exhibit in 2008 and is on display at the On the Wall and in the Round exhibit at the Edwardsville Arts Center until Feb. 14. Although Magee already has a large portfolio of work to his credit, he has a difficult time favoring any of his creations over another. "I have a hard time thinking of my works in terms of favorites," he said. "There are some that I think are more successful than others, and there are some that viewers respond to in ways that I would never have anticipated. Sometimes the power of the artworks changes over time. "There are some works that have taken on a life of their own. My Obama portrait 'Change,' is a good example. It has reached 10 times more people than all of my other works combined. People respond to it because it resonates with this particular moment in time," Magee added. Magee is still absorbing all of the attention he and "Change" have received since the Time magazine display. "The attention and interest has not really died down yet," he said. "I am trying to remain philosophical about the whole thing, and thankful for the exposure. Ultimately, I will have a couple of nice things to add to my resume, and the satisfaction of knowing that what I am doing is reaching people in a meaningful way." In addition to the nod in Time, Magee and his work have been featured on a KSDK-TV newscast and in several local newspapers. He attributes all of this current attention to mostly sheer luck. "After I completed the sculpture "Change," my good friend David Dandridge posted an image of the sculpture on his flickr.com web page," he said. "This was shortly before the election, and the photo received lots of attention. After the election, I was contacted by Time magazine. Their photo editors had found my image on flickr.com, along with several other Obama-themed photos and artwork. They asked for permission to publish the image. Of course, I said 'yes,' " he added. Magee sold "Change" on eBay for $1,376 and delivered the sculpture to its new owners in Washington DC. Although he was "always interested in art and in constructing things" from an early age, Magee knew that the sculpture area was the right focus for him. "Sculpture was always the logical choice for me because it is the least limited fine art discipline," he explained. "Materials, concepts, form, scale, site specificity, and dimensionality are all at the discretion of the sculptor. I responded to that kind of freedom, and still do." 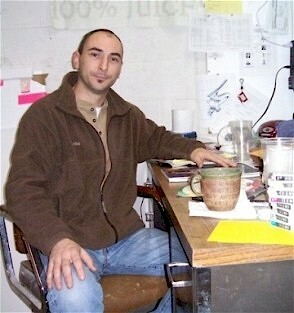 A native of Arkansas, Magee earned a bachelor of fine arts degree from Arkansas State University in 1996. He worked at a museum in Arizona for a few years before relocating to St. Louis, all the while making artwork and exhibiting pieces where possible. In 2007 he decided to pursue his masters degree. "SIUE was the only logical choice for me," he said. "The department and facilities are very strong. The faculty is impressive, committed and wholly invested in the students. So far I have found the MFA program at SIUE to be well organized, welcoming, nurturing and supportive. There are many opportunities here that you will not find elsewhere. For example, the Sculpture on Campus program is unique in the country. It provides an amazing opportunity for students and a wonderful outreach for the community." Magee received funding to create a piece for the 2008-09 Sculpture on Campus program. Each year, the program committee selects 12 student applicants to participate in the program. Students receive $500 to construct a large-scale art piece, which is then displayed on the SIUE campus for a year. Magee's piece "Lineage" featured a clothesline sporting worn denim jeans and was constructed shortly before the Fall 2008 semester began. Unfortunately, the piece was vandalized later that same semester and its components have not been replaced. Eventually, Magee hopes to end up in the front of the studio instructing others. "I hope to be teaching," he said. "I want to inspire students to explore sculpture in ways that they never considered before." More of Magee's work can be viewed on his MySpace page at http://profile.myspace.com/index.cfm?fuseaction=user.viewprofile&friendid=183446945. The display in Time magazine can be viewed at http://www.time.com/time/photogallery/0,29307,1866936_1815489,00.html.